Sticky, sweet, light & fluffy warm buns of heaven. Cinnamon rolls to me are the quintessential weekend brunch treat. A relaxing Sunday morning, you sleep in, make a fresh pot of coffee, and enjoy the morning as you sink your teeth into one of these fluffy pieces of sweet breakfast perfection. Sounds pretty wonderful, #amiright?! These are an excellent option for when you’re hosting brunch, making a special breakfast for your friends or family, or simply because it’s the weekend and you deserve it! Nervous to work with yeast? I totally get it. I used to deliberately avoid all recipes that had yeast in them. And then one day, I was determined to make challah bread, and I’ve been a yeast-baking-lover ever since! So, don’t be intimidated here, you can do this! Just take each step one at a time, and you’ll see that working with yeast is totally worth it for the end result. PLUS! These cinnababies are conveniently vegan & dairy-free! I say conveniently because they’re not an inferior version of non-vegan cinnamon rolls. They’re not just for if you are vegan. They’re for EVERYONE – and if you’re vegan or have a dairy allergy, you can have them too! 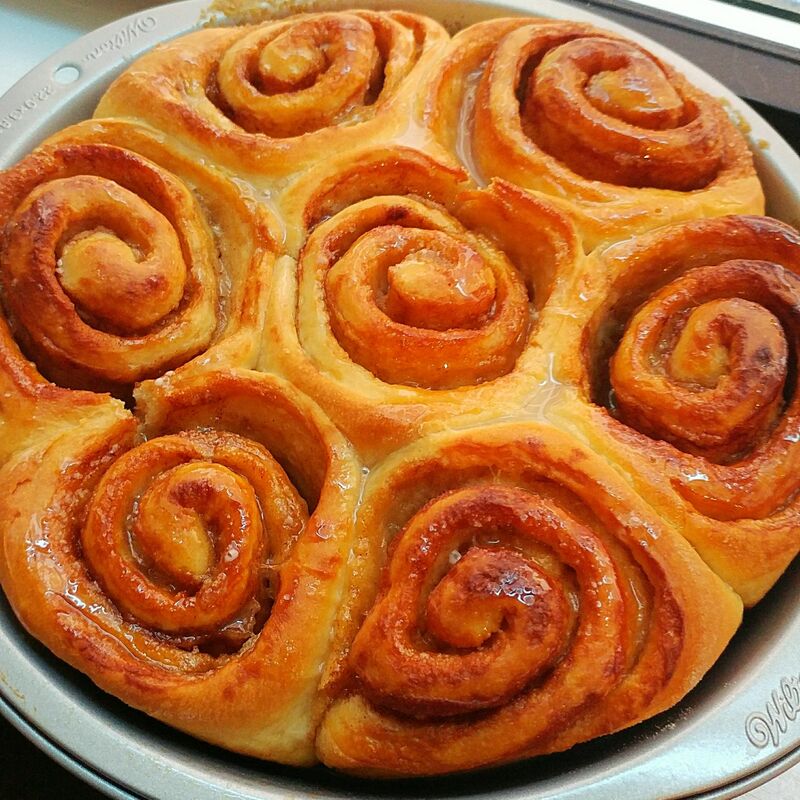 Because everyone desires the chance to eat a warm melt-in-your-mouth cinnamon roll. Well, the sooner we get starter, the sooner you can have one of these in your mouth. So let’s begin, shall we? The Best, Conveniently Vegan, Cinnamon Rolls! 1) Warm your 1/4 cup water in the microwave for about 20 seconds. You want it warm, but not hot. Stir in the 1 Tablespoon of brown sugar. Then sprinkle the yeast on top. Stir the yeast in with just a few strokes, gently. Allow this mixture to sit for about 15 minutes. This is called proofing the yeast– we want to make sure it’s active/alive/working. The yeast will feed on the sugar and the mixture should grow and double in size. If there is no chemical reaction and the yeast mixture doesn’t grow, the yeast could be dead. If it is, start over, repeating this step. If you’ve bought the yeast fresh, you should be OK. Just make sure to check the expiration date if you’ve had it for awhile. 2) While your yeast proofs, melt the 1/4 cup + 2 Tablespoons of vegan butter. Whisk it into the room temperature 1 1/4 cups of almond milk. Set that aside. 3) In a large bowl, whisk together 4 cups of all-purpose flour and the 1/2 tsp salt. 4) Now you have all the components ready to make the rolls! Pour the two liquid mixtures– the yeast mixture and the butter/milk mixture– into the large bowl with the flour. Use a spatula to gently fold the ingredients together: Cut the spatula through the middle, scoop up from the bottom towards yourself, and then turn the spatula over, kind of like you’re flipping a pancake. Once the ingredients are more combined, switch to using your hands. You want to knead the dough. Here’s a great YouTube Video on how to Knead Dough (from AllRecipes). I typically keep the dough in the bowl for kneading at this point. If your dough is too sticky, add a bit more flour. If it’s too dry, add a touch of almond milk. The ball of dough should stick together and be smooth, but not be so sticky that it sticks to your hands when you touch it. 5) Coat a large bowl with olive oil. I use olive oil cooking spray and spray a thin layer on the inside of the bowl. Take your dough ball from the bowl you used to mix everything together, and put it into this fresh, oil-coated bowl. Place a clean dishtowel over the bowl and place the bowl in the oven to let the dough rise. THE OVEN SHOULD BE OFF! I just put it in the oven to create a draft-free environment. Placing it in the microwave (again, with the microwave not being used) would work too. Let the dough rise for about 90 minutes, or until at least doubled in size. 6) Look how much the dough grew! Now, take your fist, and gently but swiftly punch into the middle of the dough. It’ll deflate. Knead the dough a few more times. 7) Next, you’ll want a clean surface or pastry mat/board to roll out your dough. Sprinkle that surface liberally with flour, and create a little flour pile in the corner of the area, so that you can easily incorporate more flour as you work, as needed. 8) Put the dough onto the prepared surface. Flour your rolling pin, and flour the dough-ball. You want to make sure the dough doesn’t stick to the surface or the the rolling pin. 11) From the long side of the rectangle, roll the dough up as tightly as you can. Now you’ll have a long dough log. Don’t worry, it doesn’t have to be perfect. 12) Take a sharp knife and cut about every inch, creating about 15 cinnamon rolls. 13) Grease two round cake pans with olive oil / cooking spray. Arrange the rolls in each one. The rolls should be touching. 14) Preheat your oven to 350 degrees F.
15) Cover the pans with that same clean dish towel and allow them to rise for about 30 minutes. This time, don’t put them into the oven, since now the oven is on. I just did this step with the pans on the counter. The rolls will continue to grow in size and should be smooshed together after the additional rise time. 16) BAKING TIME! Prepare to have your apartment/house spell like cinnamon HEAVEN! Remove the towel from on top of the pans, and bake the two pans in the oven for about 30 minutes, or until the rolls become a light golden brown. 17) Remove the pans from the oven and allow the rolls to cool in the pans. If you’re serving them right away, then now is the time to make the glaze. If you’re saving them to serve later, then cool them completely and cover with plastic wrap until you’re ready to serve. TIP: THEY’RE SO FINGER-LICKING DELICIOUS WARM!! Warm, fresh, and gooey is how I’d recommend them. If you’re saving them for later, then when you’re ready to serve them, pop them back into a 350 degree oven for about 10 minutes to warm them back up. Presto– you have warm buns again! 18) The glaze: Sift the 2 cups of powdered sugar into a bowl. Whisk in 4 Tablespoons of almond milk and about 1/2 tsp vanilla extract. Whisk quickly until the powdered sugar dissolves into the almond milk. If the mixture isn’t pour-able, add more almond milk. If it’s TOO liquidy, add a touch more powdered sugar. This glaze isn’t as thick as, say, the icing that store-bought cinnamon buns come with. Rather it’s more of a glossy, sweet accent to enhance the already fluffy and tasty cinnamon buns. 19) Pour the glaze over the warm cinnamon buns. If your mouth wasn’t watering before, it surely will be now! Once the glaze is poured…the moment has arrived to EAT! Cut around the shape of each roll with a knife. Choose the one you want (I always go for that middle bun, but the choice is yours) and NOMMMMMMMM. Share, savor, & enjoy!!! You just went through this whole process to make special fluffy cinnamon-sugary buns– you deserve this!!! Don’t forget the spread the love once you bake ’em!! Tag @thefetchingfoodie and #thefetchingfoodie on social media when you post. I’d love to see your cinnabuns!! Thank you!! They are finder-licking good! Let me know if you make ’em — I’d love to see pics!